What is the height of Spider-Man and Andrew Garfield? Does Andrew Garfield's height fit the Spider-Man character's height? This post will about that, this post will tell what the original listed height of Spider-Man really is. I know there are people who also wonder about these questions so I decided to write about the height of Andrew Garfield and Spider-Man here, this is most likely a comparison. Andrew Garfield, the lead actor in the movie "The Amazing Spider-Man 2", who acts as Peter Parker/ Spider-Man in the movie is a 6 ft tall guy at 183 cm. His height I guess is pretty ideal, not short and yet not that tall, just enough. Read more about Andrew Garfield's height in the link below. 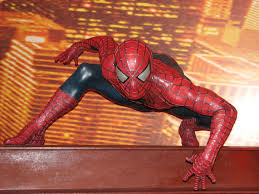 Did you know that the height of Spider-Man, the real one in the story, is 5' 10" only. This height listing is according to the Marvel Database. A link to about Spider-Man/ Peter Parker's height is posted below. So, based on those height listings, the real height of Spider-Man is a bit smaller than Andrew Garfield's. Andrew Garfield was like 2 inch taller than the real height of the character. Tobey Maguire's height on the other hand was only 5' 7" by the way.